Arm hits power walls as it increases speed, so goes back and designs a slow processor to couple w fast ones. Of course, it does better than before, so future feature phones will have speed of todays smartphones but todays battery life. Are feature phones w smartphone speeds still feature phones? 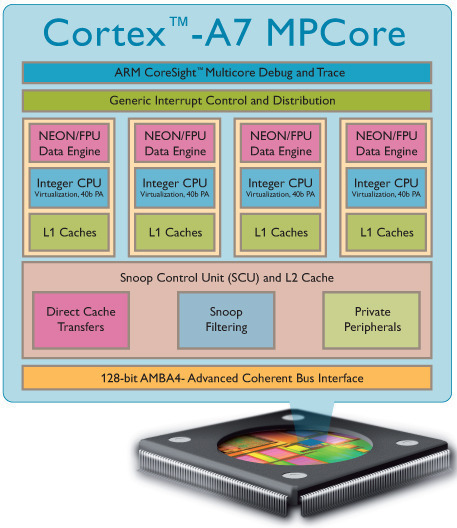 On Wednesday, ARM formally unveiled its next-generation smartphone processor, the Cortex A7, codenamed “Kingfisher.” But there was much more to the A7′s launch than just the unveiling of a new processor architecture for smartphones. The chip company also announced plans to pair the A7 with the much larger and more powerful Cortex A15 in phones and tablets, using a technique called heterogeneous multiprocessing (or “big.LITTLE," as ARM prefers to call it) to dynamically move lighter workloads from the larger, more power-hungry A15 to the leaner A7 in order to extend mobile battery life. When used in a dual-core configuration, the A7 will bring the performance characteristics of what is currently a $500 phone to the $100 “feature phones” of 2013. These future feature phones will have the same capabilities as today's high-end smartphones, but they'll have the low prices and long battery life that the feature phone market demands. For the high-end “superphones” and tablets of 2013, the A7 will be paired with the much larger and more powerful A15 core to yield a processor that sips power like a feature phone when all you're doing is some light Web surfing, but can crank up the juice when you're gaming.